Castle Crush is the thirtieth level of Donkey Kong Country 2: Diddy's Kong Quest and the third level of K. Rool's Keep. In the Game Boy Advance port, it switched positions with Windy Well on the world map, becoming the second level and the twenty-ninth level overall. Castle Crush is one of the two levels to not have an identically-named counterpart in Donkey Kong Land 2, as it was replaced by Dungeon Danger. Castle Crush is the first castle level of the game, and it features a gimmick not found in any other level: a rising floor. 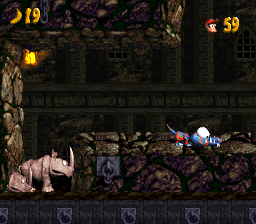 As the floor rises, the Kongs must avoid being squished by ceilings, and dodge enemies that appear in their path. The most common enemies include Klampons and Spinys. Zingers appear in later parts of the level. Two Animal Friends appear in Castle Crush, each appearing in an Animal Barrel hidden from the main path. 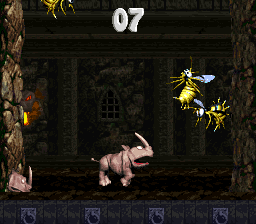 The first one is Rambi the Rhino, who appears near the level start. The Kongs can find his Animal Barrel by picking up the first DK Barrel in the level and then defeat a nearby Kutlass on the left. The Animal Barrel appears behind the Kutlass. Rambi is required for opening the entrance to the first Bonus Area. His associated No Animal Sign appears just before the Star Barrel. Shortly after the Star Barrel, the Kongs can transform into Squawks the Parrot, whose Animal Barrel is hidden behind a wall located left of a DK Barrel. Squawks can quickly flap through the level rather than wait for the floor to continue rising. 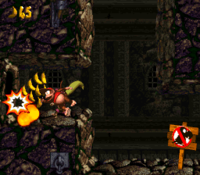 The Kongs can only access the second Bonus Area after crossing his No Animal Sign, as this provides them with the TNT Barrel to break open a wall. The Super Nintendo Entertainment System version of Castle Crush contains a fatal glitch. The Kongs begin the level on a flat pathway surrounded by walls. Soon, a separate structure rises and lifts them off the ground, leading them up to a large group of bananas. As they are lifted higher, a Neek and a Spiny emerge from nearby alcoves to attack. A DK Barrel is located to the left of them on the other side of the wall as they encounter these foes. When the floor rises high enough, the wall blocking them from the barrel ends, allowing them to reach the barrel, which they can use to defeat a Kutlass in a narrow passage higher up. A passage is located to the left of the Kutlass, and an alternate path is to the right of it. The path on the left contains an Animal Barrel, and if the heroes enter it, they are turned into Rambi. A Krook stands near the path on the right and tries to hit the Kongs with its hooks as they come by. However, the foe is soon crushed into the ceiling from the rising floor. Once the floor rises higher, the two pathways join together and the heroes are lifted into a single passage that contains a Neek, and later, a Kruncha. After the heroes pass this enemy, they are lifted into a wide, open room with Spinies on both sides of it. A few structures are above the foes, and a collectible is inside of the gaps between each of the structures. The letter K is against the wall to the right, while Banana Bunch is in the gap farther to the left of it. A lone banana is in the gap to the left of here, while a Banana Coin is on the edge of the room near the wall. Once the primates are raised past the structures, they make their way up a wide passage; as they head up, Klampons drop out of nearby alcoves to attack them. Eventually, they are lifted towards an alcove that contains a Banana Bunch. The heroes can find a Krook farther above here that is separated by a wall. After the floor raises them higher, the wall ends, allowing them to reach the Krook. Zingers are above this area, and once they are passed, the heroes reach an alcove that contains a Banana Coin on a platform. The floor then leads them up through a passage with a few alcoves on the sides of it, which Spinies drop out of to attack the Kongs. If they manage to pass these foes, they are raised to a ledge with a group of bananas that form an arrow pointing to a wall, which Rambi can break open to reach a Bonus Level. 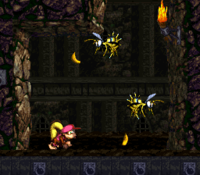 Once they are lifted past these bananas, they encounter a Klampon, who marches near an alcove in the wall that contains six bananas. Dixie stands near the Star Barrel. After they pass the bananas and travel higher, they come up to a No Animal Sign that makes Rambi disappear when passed. The duo is also given a Banana Bunch if they lead the Animal Friend to the sign. The primates are soon lifted into a wide room that they must travel east through to find a passage on the other side of it. As they try to reach the opposite end of the room, a Spiny and a Klampon get in their way. Once they make it into the next passage, they come past a narrow alcove containing three bananas and then an Auto Fire Barrel that can blast them to another Auto Fire Barrel, which can then send them onto a high ledge with a Spiny on it far above the rising floor. If the heroes drop down this ledge, they reach a safe area containing the letter O and a Banana Bunch. At this point in the level, they can still not progress without the rising floor, so they must wait for it. Soon, the floor raises them to a room with a passage on the far end of it. They must quickly run across this room to reach the passage, while fighting off five Spinies that try to get in their way. If they reach the passage on the other side of the room, they are lifted into a large room with the level's Star Barrel in it. If the heroes travel farther upwards from here, they can find an area that contains a DK Barrel, a Zinger, and an alcove with some bananas in it. If they run through the wall to the left of here, they can find a hidden area with an Animal Barrel in it, which can turn the primates into Squawks if they enter it. An alternate path is above the Animal Friend that leads him past a trio of Krooks. If the primates do not take this secret passage, they must instead head up through a wider passage with the three aforementioned Krooks along the side of it. The foes are soon smashed by the rising floor, which leads the heroes to the meeting point of this path and the hidden path. If they continue to rise from here, they come up to several Zingers that travel back and forth in a horizontal path. A passage leading to the east is at the top of this area, and more passages leading north and south branch from it. With Squawks, they are able to take the passage to the south if the floor has not risen too much. This passage leads to the hidden DK Coin and many bananas. There are north passages to the north from here, and the one in the far right end of the area contains the letter N. The other passage contains a Zinger, who can be defeated with Squawks's nut projectiles. After they head through one of the passages, they can journey to the left to find a No Animal Sign. If they pass it with Squawks, the Animal Friend disappears and a TNT Barrel appears next to them as a prize for leading him to the sign. They can use the barrel to bust open a wall in a nearby alcove, which contains a group of bananas that form together to create the shape of an arrow pointing towards the wall. If they walk into the wall after breaking it open, they are led to a Bonus Level. If the play the bonus, they are led to an alcove located farther above here when they exit the bonus. A Klampon walks along a path to the right of this alcove. On the other side of the area, the heroes can find a passage that they can be raised through by the floor to reach a wider passage to the west with a Klampon and a Spiny in it. If they manage to reach the passage on the opposite side of this room, they are lifted up a long room with several alcoves on the sides of it. Klampons and Spinies emerge from these alcoves and try to drop down on the Kongs. Once they pass all of the enemy-filled alcoves, they make their way up to a wider room full of Mini-Neckies that swoop down at them as they progress. If they continue to rise from here, they soon make their way to a few Zingers that move in a circular pattern. As they rise through this area, they can notice a DK Barrel on the other side of a wall, which ends when the floor reaches a higher elevation. Once the heroes have access to the barrel, they are raised to an alcove that contains a Kruncha and the letter G.
The Kongs dodge some Zingers as they rise through the level. Another alcove is to the right of here with six bananas in it. The primates are soon raised high into a narrower passage with two Krooks in long, thin spaces on the sides of it. They must dodge their hook projectiles, until the foes are soon crushed by the rising floor. Farther above this area, the duo can find a pathway leading them to the east past a trio of Spinies. In a wider room higher from here, they can find four Zingers that move in circular paths and orbit bananas. Once they pass the foes, they access a wide room with another passage on the opposite side of it. There are two Klampons with a Spiny between them in this area that the Kongs must pass as they head through the room. Once they reach the passage, they are led into a higher room with a barrel at the end of it. There are two passages at the top of the room, but one, which contains a Banana Coin and a Banana Bunch, is blocked off by a Zinger, who can only be defeated with the nearby barrel. The opposite passage leads simply to a trio of bananas. Either one of the passages can be used to reach a room that contains an End of Level Target. If they hit this target, they complete the level. Additionally, they can hit the target from a high platform to win a prize from it. The Kongs open the path to the second Bonus Area. As Rambi, the Kongs must continue through the first portion of the level. After encountering two Zingers and three Spinys, there is a group of Bananas arranged in the formation of a left-facing arrow, pointing to a wall. Rambi must use his Supercharge attack to break the wall open and enter into the Bonus Area. In this challenge, the rising floor carries Rambi up a vertical path with Zingers. Rambi has 10 seconds to defeat all six Zingers along the way, causing a Kremkoin to appear just outside the exit. The second Bonus Area's location is also pointed to by Bananas in the shape of a left-facing arrow. After crossing the No Animal Sign with Squawks, the Kongs are awarded with a TNT Barrel. They must throw it at the wall on the left pointed to by some Bananas. This creates an opening to the next Bonus Area. The Bonus Area is one of the longest ones, and it features a time limit of 30 seconds. The floor is rising rapidly, and the Kongs must quickly move underneath each gap while going up. They can also collect some Bananas along the way. The Kremkoin appears on a platform at the very top of the Bonus Area. 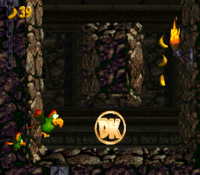 DK Coin After the Kongs transform into Squawks, he must fly upward and pass some Krooks and Zingers. After passing these enemies, Squawks must go right and then flap down below into a passage, where the DK Coin is located. Golden Feather (GBA version) Shortly after exiting the second Bonus Area, a Klampon and Spiny start walking on the rising floor. 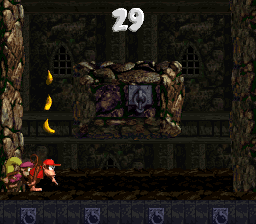 As it is rising, the Kongs must quickly move to the rightmost part of the floor and jump at the Golden Feather, which is positioned at the top-right corner, right between the ceiling and the wall. They must quickly obtain the Golden Feather before the floor crashes them into the ceiling. Photograph (GBA version) After transforming into Squawks, he must fly up a narrow passage. There are three Krooks, and the middle Krook displays a photograph above its head. Squawks can defeat the Krook by spitting a nut at it. The photograph is a picture of Krook, and it appears in the sixth page of the Scrapbook. As the Kongs move up through the start of the level, they eventually enter into a wide area with two Spinies and a few floating pillars. Collectibles are located between each pillar, and the letter K can be collected from the gap on the far right. Shortly after Rambi's No Animal Sign, the Kongs are lifted towards two Auto-Fire Barrels which blast them up onto a tall platform. 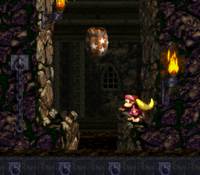 Before the floor rises up too high, Kongs can drop down from the platform and collect the letter O, which is floating slightly above ground, next to the tall platform's wall. The letter N is floating in a gap between the wall just right of the No Animal Sign. Late into the level, after the final DK Barrel, the Kongs encounter the second pink Kruncha, who emerges from an alcove containing the letter G.
Rambi at the start of the level. Rambi entering the first Bonus Area. Squawks flapping past two Krooks. This page was last edited on April 6, 2019, at 02:38.